While some will fire up the grill with burgers and hot dogs and line the table with potato salad, baked beans and a fresh salad, others may be looking for a way to celebrate Independence Day on Tuesday, July 4. If you're still looking for plans, there are more than 20 firework displays happening around the Valley. A lot of them are free, but some are not. We've gathered up all the festivals we could find and have them listed below. Did we miss one? Send an email to Josh.Frigerio@abc15.com and we'll add it! The City of Phoenix's After Dark in the Park will have inflatable activities for the kids, food trucks, live entertainment and resource booths. When it gets dark, there will also be a fireworks show. The Reach 11 Sports Complex in North Phoenix will host a fireworks show in North Phoenix. The concession stand will also be open for snacks and cold treats. Time: 7:30 p.m. - 9 p.m. Celebrate America’s independence at Rawhide Western Town in Chandler. The event will have an evening fireworks show, water slides, bounce houses, live music from Zebop and LaDezz, and food. Rawhide’s stunt shows and shops will be open, too. The Steakhouse is offering a buffet for $10 - $18 per person. Admission: $20 - $25, plus taxes and service fees. Parking is $10 (bring cash). The Arizona Diamondbacks take on the Colorado Rockies at home on July 1. The first 20,000 fans will receive a patriotic t-shirt from State Forty Eight. After the game, the lights will dim for an after-game fireworks show. Cave Creek's Frontier Town will host an early Independence Day celebration with fireworks on July 1. Doors open at 4 p.m. There will be live music, a splash area for the kids, a mechanical bull and food for sale. Fireworks are scheduled to start at 9 p.m.
Time: doors open at 4 p.m. Fireworks to start at 9 p.m. This year marks the 18th annual Anthem Independence Day celebration. The free festival will have inflatables and rides, some water activities, music and dancing. The fireworks show is slated for 9:30 p.m., weather-permitting. The festival itself is free. Ride wristbands are available for $12 - $15. Cool-off with an Independence Day at Wet n’ Wild water park in Glendale. The park will have a fireworks show on July 3. Fireworks are slated to start between 8:45 p.m. and 9 p.m. The fireworks are included with regular water park admission. Between July 1-4, active military, veterans and first responders (police, fire, EMS) can enjoy the water park for FREE. You need to have your ID. Up to six immediate family members will receive half-off admission. Admission: $29.99 - $42.99. Parking is $8. Cave Creek's annual fireworks celebration takes place on July 3. There will be live music, kid's activities and food specials at Harold's Corral, Roadhouse and The Buffalo Chip, all sponsors of the fireworks show. Doors open at 5:30 p.m. It is free to get in. Admission is first come, first served. Phoenix's annual Light Up the Sky event will have inflatables for the kids, games, food and a fireworks show. The event is free. You can watch fireworks over Lake Pleasant from Pleasant Harbor Marina. The marina is hosting a festival from 3 p.m. - 11 p.m. There will be food trucks, free kids activities, water slides, live music and bounce houses. Admission is $15 per vehicle. Time: 3 p.m. - 11 p.m. Fireworks at 9 p.m.
WestWorld will once against host Scottsdale’s Fourth of July Celebration. The event features daytime events like All-Star Stunt Dogs Challenge, BMX shows, meet and greets with Moana, Belle, Spider-man and Wonder Woman, a petting zoo and bull riding show, plus other activities. Fireworks are scheduled for 9 p.m. There are a variety of ticket and ride options, including a fireworks-only ticket. Be sure to view the various packages on the website. Time: 3 p.m. – 9:30 p.m. This year marks the 32nd annual Fabulous Phoenix Fourth Festival. More than 10,000 people attended last year, the city said. Fireworks are expected to start at 9:30 p.m. During the hours before, there will be two music stages, food vendors and a classic car show. Westgate’s fireworks will start at 9 p.m. on Independence Day. There will also be two music stages, a splash pad, games, face painting, balloon animals, a DJ and dancing. Restaurants, we’re told, will have “grab-and-go” meals. You can bring blankets and lawn chairs to be more comfortable. Time: 5 p.m. – 9:30 p.m. Spend Independence Day at the Phoenix Zoo and watch the Tempe Town Lake fireworks show from a special”VIP” area in the back of the zoo. The Phoenix Zoo’s annual event starts with a backyard BBQ with burgers, hot dogs, salad and baked beans. There will be special animal guest appearances, free carousel rides, games and inflatable bounce house and slides. Some of the trails may not be open. Time: 7 p.m. – 10 p.m.
Tempe Town Lake will host the 66th annual Independence Day fireworks show this year. Gates to Tempe Beach Park open at 5 p.m. Fireworks are scheduled to start at 9:15 p.m. The Family Fun Fest will have inflatable rides and games for kids. For the adults, there will be live music and a beer garden. Time: Gates open at 5 p.m. The Queen Creek family farm will host its annual fireworks show and festival again this year. Gates open at 4 p.m. Admission is $20 per carload. A wristband for unlimited games and rides is $15. Food trucks will be available. Fireworks are scheduled to start at 8:45 p.m.
Time: 4 p.m. – 10 p.m. Admission: $20 per vehicle. VIP is $40 per person, $25 per child 3-8. Chandler’s Fourth of July fireworks show will have live music, laser tag, a mobile gaming truck, inflatable games and a basketball shootout. Fireworks are scheduled to start at 9 p.m. at Tumbleweed Park. Admission is free and parking is $5 cash-only. Time: 5 p.m. – 10:30 p.m.
Mesa’s Celebration of Freedom festival has fireworks, splash zones, two music stages, a fire truck that will shoot water, a naturalization ceremony, and a historic flags of U.S. presentation. Fireworks are scheduled to start at 9:30 p.m. Water bottles are allowed in. There will be refill stations throughout the festival. Head to the Peoria Sports Complex for the 2017 All-American Festival. There will be water activities and a kids area, a corn hole tournament and food-eating contests. Lawn chairs, blankets and coolers are allowed in. Time: 5 p.m. – 10 p.m.
Fountain Hills’ “Fourth at the Fountain” will take place at Fountain Park. There will be music, a DJ and games. An evening fireworks show will conclude the event. Guests can bring in lawn chairs, blankets and picnic baskets. Vendors will also be selling food at the event. Hit the ballpark for a baseball game and fireworks. Rookies from the Kansas City Royals and Texas Rangers will play a game of baseball at Surprise Stadium. After the game, fireworks will light up the sky. Admission is free with a canned food donation. Rookie game between Kansas City Royals & Texas Rangers starts at 5:30 p.m.
Fireworks to start at approximately 8:30 p.m.
Goodyear ballpark with host its annual Independence Day festival with inflatable water slides, games and fireworks. Admission and parking is free. Rides are $5 - $10. 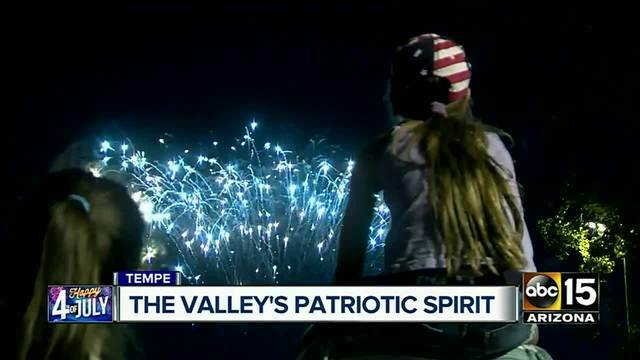 Maricopa’s Great American Fourth festival will take place at Copper Sky Regional Park. There will be live music, carnival games and a beer garden. There will be a Kids Zone with inflatable games for $5. The Aquatic Center will also be open for swimming for $10-$15 per person. Fireworks scheduled to start around 9 p.m.
Time: 6 p.m. – 10 p.m. Fireworks around 9 p.m. Admission: Free. Kids Zone is $5 per child, cash only. Unlimited rides. Buckeye’s Fourth of July Festival will take place at Youngker High School. There will be family games and food vendors. Time: 6 p.m. – 9:30 p.m.
Apache Junction’s Fourth of July fireworks show will take place at Apache Junction High School’s football field. Starting at 6:30 p.m., there will be free watermelon until it runs out, games, live entertainment and inflatables. Fireworks should start at 8:30 p.m.
Casa Grande’s Fourth of July fireworks show will take place at the Paul Mason Sportsplex at 6:30 p.m. There will be games and food. The free fireworks show is slated to start at 9 p.m. Before that, the Palm Island Aquatics Center will open the pools form 10 a.m. - 2 p.m. and host themed games and activities. Admission to the pool will be 50-percent off, $1 for adults and $0.50 for children. Tolleson’s Fourth of July celebration and fireworks will take place at Veterans Park. Per their Facebook page, the free event will run from 4:30 p.m. - 9:30 p.m. There will be entertainment, watermelon and a water slide. Time: 4:30 p.m. – 9:30 p.m. The Wigwam’s annual “Red, White & Boom” festival will have a live DJ, inflatable rides and water slides and fireworks. The fireworks show is free. Games and inflatables are $10 for an unlimited wristband. Gilbert will celebrate Independence Day with a fireworks show at Higley High School on July 4. Food trucks will also be on-site. You can bring your own blankets and chairs. Admission and parking are free. You can also view the fireworks from Centennial Elementary, Legacy Traditional Academy and Higley Unified School District Administration parking lot. Time: Gates open at 6 p.m. Fireworks scheduled for 8:30 p.m.